If I didn’t have you at Philly Cheesesteak, I’m not really sure what I can say to reel you in farther, but I’ll give it a shot. This recipe came about after Mr Napping and I split a Philly Cheesesteak sandwich while we were on vacation in Northern Idaho. However, I’ve been trying to be more conscientious of what and how much I’m eating. While that sandwich was absolutely amazing, it was also loaded with calories. Which is probably why is was so amazing. 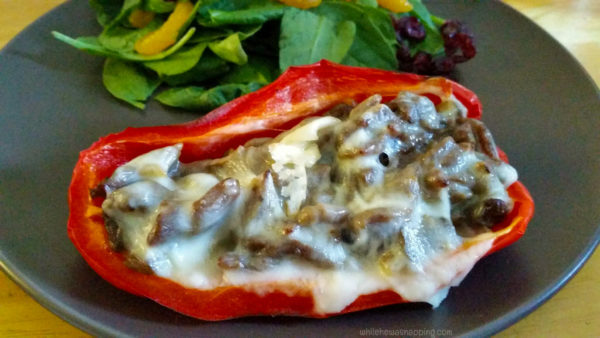 In an effort to keep the flavor, but reduce the caloric value of such a meal, I made Philly Cheesesteak Stuffed Red Peppers. I wouldn’t go so far as to call this a low-calorie meal – but it’s definitely lower in calories than a Philly Cheesesteak sandwich. Mr Napping was quite skeptical when I told him we were having Philly Cheesesteak without the bread – the man loves his carbs – but he adored these peppers and fought tooth and nail to get the leftovers. It was a total hit. In a large skillet on the stove, melt the butter or warm the oil. Depending on what kind of oil you use, you may need to melt it. Sauté the steak strips in the oil or butter. When the steak is no longer pink, toss in the mushrooms. Sauté the steak and mushrooms until they are tender. Cut the bell peppers in half, lengthwise. Clean out the seeds. Put a layer of foil on a baking sheet. Lay the pepper halves on the foil. Fill each pepper with the steak and mushrooms. Place a slice of mozzarella cheese on the top of each pepper and bake for 5-7 more minutes. When the cheese is melted, remove the peppers from the oven and let cool for 5 minutes. I love this with a big spinach salad! So delicious. 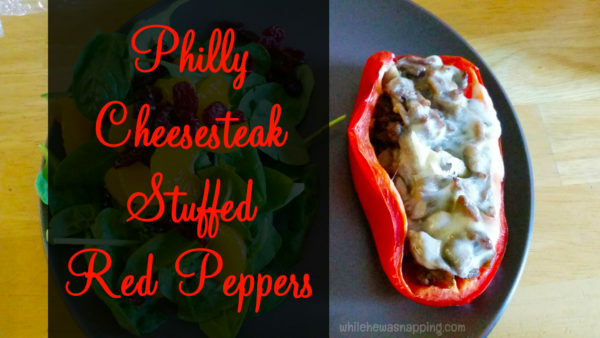 It’s a great Philly Cheesesteak alternative for anyone watching carbs and calories. My boys loved them too. Next time, I’m gonna try them in the crock pot… Who doesn’t love a good slow cooker meal? !